The Times New Roman: Blast from the Past: Spectra! Blast from the Past: Spectra! I was just reading my favorite humor/gossip site, dlisted.com and stumbled upon something I had to share. Michael, the man who writes and runs the blog is not only hilarious but he's also a Generation Y genius. He manages to remind me of things that I forgot about decades ago. Today, Spectra was one of those total recalls. Spectra was one of my favorite toys to play with when I was little. I think I got her because she was different than the other Barbies on the shelf at Children's Palace toy store. 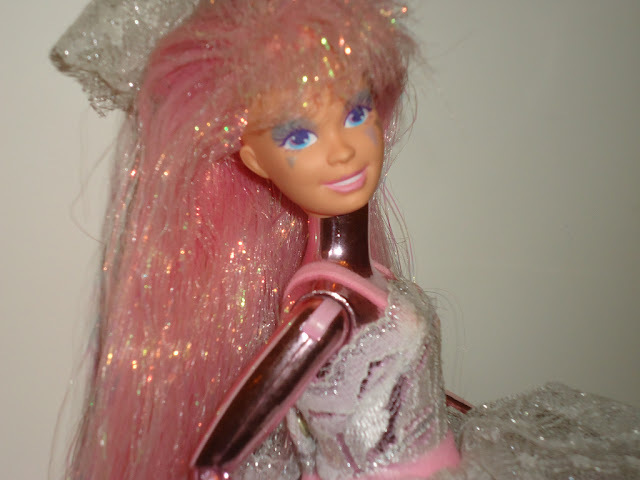 She was metallic pink, shiny, donned in lace, had strands of glitter for hair, owned a beloved dog named 'Spark' (note to self: remember this name) and came from another planet. I guess my interests haven't changed much in 20+ years.